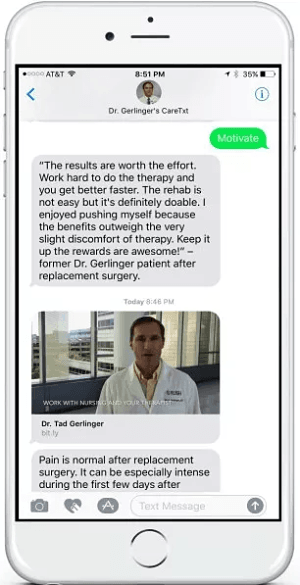 An automated text messaging system increases patient engagement with home-based exercises and promotes faster recovery after total joint arthroplasty, according to a study published in the January 16, 2019 issue of The Journal of Bone & Joint Surgery. “A chatbot that texts timely, informative, and encouraging messages to patients can improve clinical outcomes and increase patient engagement in the early postoperative period after total joint replacement,” said lead author Kevin J. Campbell, MD, who conducted the study with colleagues at Rush University Medical Center in Chicago. Figure 1. Mockup of automated, physician-specific text messages. The texts were sent via a service called STREAMD; Dr. Campbell is the CEO and co-founder of STREAMD. Over the 6-week period after surgery, patients in the text-message group received about 90 texts. The system did not accept inbound text responses from patients, although patients could access further information on topics they selected. Patients who received automated texts performed their home exercises an average of 46 minutes per day, compared with 38 minutes in the standard-care group, a significant difference of 9 minutes per day. The texted group had greater knee motion at the 3-week follow-up visit, suggesting faster short-term recovery. By 6 weeks, knee motion was similar between groups. Patients in the text-message group stopped using opioid pain medications about 10 days sooner than those in the control group (22 days versus 32 days). They also had higher mood scores and were more likely to say that their postoperative instructions were clear. Patients assigned to automated texts also made fewer phone calls to the surgeon’s office. There was a trend toward fewer emergency department visits as well, although this difference was not statistically significant. This study provides evidence of improved outcomes when an automated text-message system makes daily contact with patients and provides relevant information and encouragement. Advantages include more time doing recommended home exercises, faster recovery of knee motion, and improved patient satisfaction. The benefits of such an automated system could be especially important at a time when more patients are undergoing joint replacement surgery with less overall contact with the treatment team. “As we search for practical methods to engage patients, automated messages providing education, support, and encouragement create a natural and convenient way for patients to receive information, potentially improving key outcomes without placing extra time demands on the surgeon and staff,” Dr. Campbell said. Campbell KJ, Louie PK, Bohl DD, et al. A novel, automated text-messaging system is effective in patients undergoing total joint arthroplasty. J Bone Joint Surg Am. 2019 Jan 16;101(2):145-151. doi: 10.2106/JBJS.17.01505.